From the Monkey King of "Journey to the West" to Jiang Ziya of "Feng Shen Bang", from the "Three Kingdoms" five tigers to the "Water Margin" 108 heroes, from the traditional Huian female to the modern anime image ... Yesterday, in Jinzhou Jinxiu Folk In the art park's puppet art museum, thousands of puppets in various shapes and styles have caused hundreds of students who come to fall to linger. The Quanzhou puppets are ancient names called the "Art of Carving and Doing Doing," and it has been nearly 1,300 years of history. The carving of the puppet head was originally driven by a puppet show and developed as a stage prop. Nowadays, this kind of carving art has begun to go down the stage, embark on the â€œcounterâ€ and enter the homes of ordinary people. The reporter Liu Wenyan has spent 7 days carving a puppet head. â€œAfter selecting materials, rough bills, carvings, crepe papers, polishing... after a dozen procedures, they are painted again and accompanied by costumes. A complete puppet is completed. It's up." Huang Jiangyi is the son of Quanzhou's famous puppet master Huang Qinghui. Although she is only 22 years old, she has been studying puppet sculpture for nearly 10 years. Huang Jiangyi told reporters that carving a complete puppet head may take approximately 7 days for more than 100 hours. This is just an ordinary puppet head. Last year, Huang Qinghui had carved a head of a Monkey King Monkey King of the Monkey King. It took a month to light this carving process. What is the price of a puppet head that is so time-consuming? According to industry sources, exquisite hand-carved puppets have a head size of around RMB 1,000. The relatively simple handmade puppet heads are around RMB 300, and the nine-headed Monkeys are worth RMB 10,000.
â€œThe price is not low, but it is difficult to achieve mass production by hand. 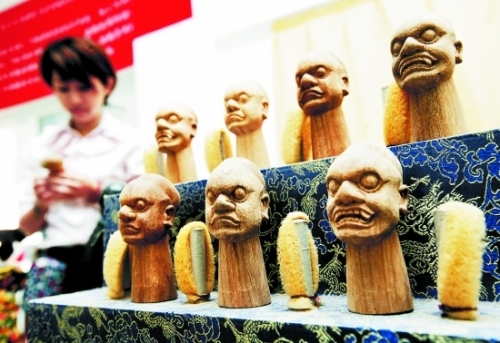 Many people are not willing to engage in this industry.â€ Huang Jiangyi said that at present, there are no more than 15 artisans engaged in carving heads of puppets in Quanzhou, of which the only one with excellent craftsmanship is only Forty-five people, many old artists are faced with no one's successors. Try to combine with modern craftsmanship how to make the production art of the puppet head maintain long-lasting vitality? Huang Qinghui began to work hard on innovation. Huang Qinghuiâ€™s innovation focuses on two points. One is the innovation of the puppet image. The nine monkey kings he created can not only move with nine mouths, but also have five pairs of eyes. â€œThe promotion and inheritance of puppets should be combined with the creative industries. This is also the key to the inheritance of puppet art.â€ In the eyes of Huang Qinghui, the Jiutou Monkey King is an attempt. Next, you can also try new ideas like puppets and cartoons. Combine. Huianâ€™s puppet engraver, Sophie Fai, is also making new attempts. He first used the acrylic raw material as a couple head, which made the couple heads look clean and not afraid of dirt. He insisted on the use of bonsai eucalyptus carvings to make the head even more textured. At the same time, Su Huihui also continuously develops new products, such as "face change", "sun god", "Zodiac" and other series. The product enters the homes of ordinary people. "The puppets are not just serving puppet dramas, they can also enter the homes of ordinary people and realize marketization." Huang Jiangyi believes that if puppet heads can be more often used as crafts, souvenirs, etc. to collect, even as children's Toys, generally promoted in the market, can better carry forward the traditional folk art of hand-carving. However, to go to the market, we must solve the problem of mass production. Will the hand-carved puppet head achieve mass production? Huang Qinghui started to discuss this issue with the person in charge of Quanzhou Jinxiu Zhuang 10 years ago. He finally decided to divide the product into three types: high, medium and low according to market demand. The high and middle puppet heads still use hand-carved eucalyptus. In addition, the low-end puppet head uses resin instead of coffin to achieve batch production through the machine. In the Fairview Puppet Art Museum, the high-end boutique puppets are priced at more than 5,000 yuan, the middle-end puppets are priced at 800 yuan, and the ordinary resin puppets and puppets are priced at less than 100 yuan. These puppet heads are very popular with customers in Southeast Asia. In the past two years, many Taiwanese customers have begun to come here. â€œConsumers have different needs for products, some of which are bought as a souvenir, some are used as souvenirs, and some are only for children. The combination of manual and mass production not only can quickly expand the market, but also can help the rapid propagation of the puppet carving art through products. â€œZeng Guoheng, general manager of Quanzhou Jinxiu Zhuang Folk Arts Park said. Next Post: "HITWON" to create "China's first European-style fashion women's brand"